Today was a great day to be paddling! The air was 61 degrees. I wish I had had something to measure the water temp but it seemed to be warming up. I paddled without any gloves. This Pic is of Cedar Hedge Lake. It is a small but beautiful lake in Interlochen. Today was the first real test of my storm paddle. It has a two fist loom that I think I will shorten a bit when I decide to build another one. Otherwise, it worked fantastic. 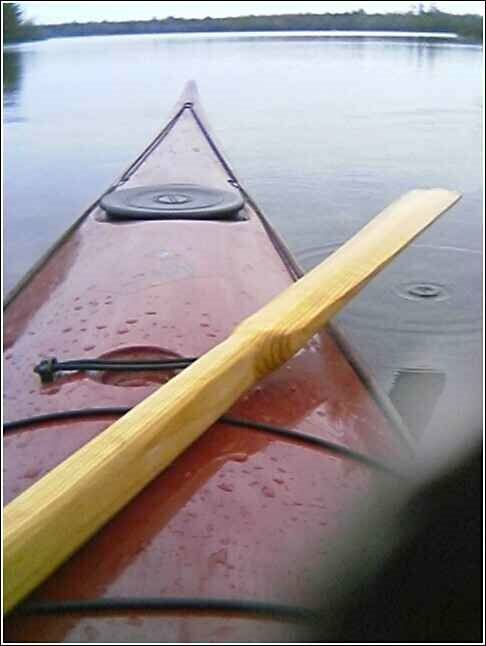 I am still paddling with my full sized Greenland paddle with no finish on it. I like the way it smells and feels, although I will probably oil it eventually. This is my first season using greenland paddles. Besides learning to roll this summer, I am going to focus on my paddle technique. This week is going to be spent doing research on different strokes. If that is your skeg cleat on the port side foredeck right in front of the cockpit, you simply need to move it a few inches behind the cockpit on the same side. Just put some tape on the deck (plastic tape like electrical tape would work great) over the old holes, fill them from the bottom with thickened epoxy, pack it in there good, and when it starts to set up pretty good, slice and scrape it clean on the underside with a chisel or something. When you drill the new holes for the bolts, drill them a bit larger, fill them with the same epoxy, let that cure, then come back and drill the correct size holes for the bolts in the middle of the epoxy plugs. I can't tell what style cleat is up there, but it looks like the metal and plastic kind. I have this kind on my kayak, and it works great just behind the coaming, cause you can pull the line in a straight line to release or lock it. I also cut the original thin skeg line a few feet back from the cleat, and tied on a thicker piece that is more comfortable to pull on, and easier to grab with gloves on.